Bar Papers – one submitted, one accepted! 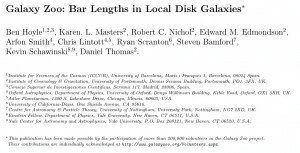 Good news for Galaxy Zoo 2 bars this week. To start with, the first bar paper (and the first ever using Zoo2 classifications) has just been accepted. I discussed our findings on the blog just after it was submitted way back in February. A lot has happened since then, and the length of time between submission and acceptance in this case has less to do with the speed of the peer review process, and more to do with me being otherwise occupied (my son was born 4 days after the paper was submitted). But anyway it’s been accepted now, and the final version will be available on the ArXiV later this week. And if that wasn’t enough, Ben has just submitted the first paper from the bar drawing project. We’re very excited about this result, and we’ll keep you posted as it progresses through the peer review process. Thanks again for all the clicks – and measurements! Paper 1, ,Paper 2 and baby boy ! The paper is now up on the arXiV in it’s (almost) final state. Probably one more update after I get the proofs. Thanks for the congrats Els. Wonderful news!! One of my favorite projects.Congrats! A Boy Awesome! Congratulations Karen on both accounts.